Today saw the long awaited release of the complete Ultima 7 on GOG and I’ve updated my GOG Ultima patcher to support both games. It adds general MIDI patches for both Ultima 7 & Serpent Isle which should offer an improvement over the default Soundblaster. As ever if there are any other patches I should include or any problems please let me know. I found another 1993 magazine hiding in the pile. 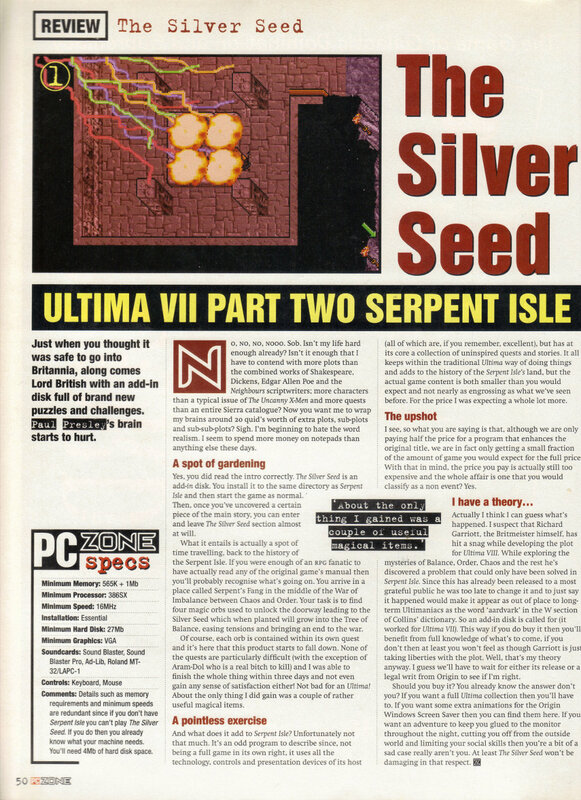 This review is from November 1993’s PC Zone. It claims that there are extra animations for the Origin FX Screen Saver with Silver Seed which would be news to me if it’s correct. 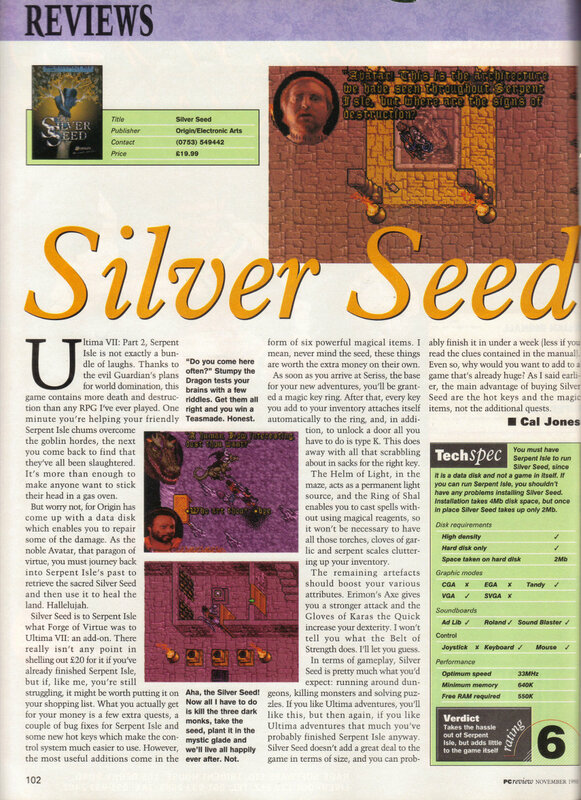 This tiny review of Silver Seed is from the November 1993 PC Format. 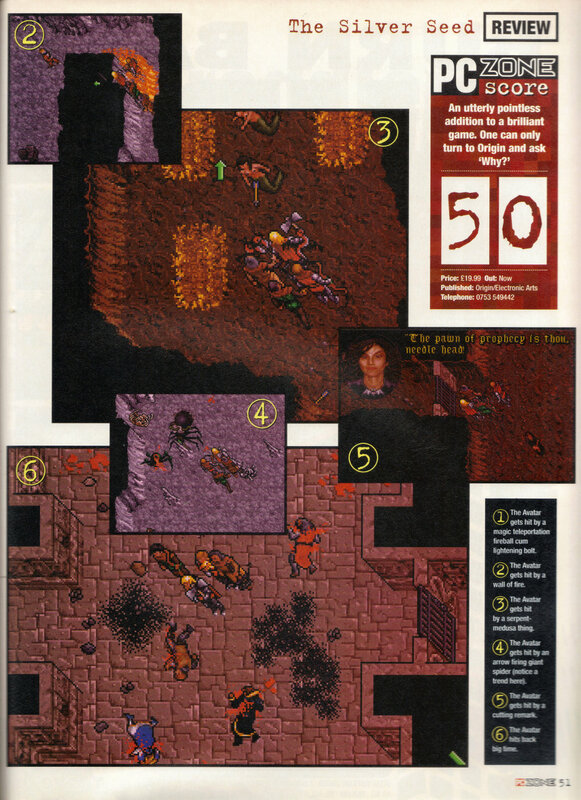 This is from the November 1993 PC Review. 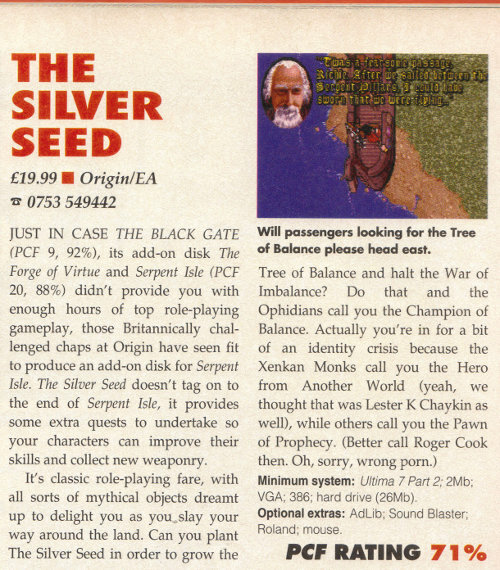 I don’t remember either Forge Of Virtue or Silver Seed getting much of a reception in any reviews I’ve seen, which is hard to argue with given how little they add to the game. Maybe at a lower price but £20 sounds like a lot even now. Before I try the next quest a dark monk teleports in. She’s not exactly polite but does give me a few clues about whats to come. 3 of the 4 quests turn out to have monks introducing them, but for the most part there advice isn’t any help. The second dungeon is a maze where each time I walk into a room the exits change. Its possible to get trapped in a room also – the blue flames are there to burn yourself to death with if you get trapped although I just reload if that happens. At the end of the correct route is a teleport. As soon as I reach it all the walls open up permanently. There are a few levels of mazes and I then run into a cat-like creature who has been persecuted due to his form and ended up here. In return for some cheese which I found on a corpse in the maze he gives me a ball which is the second orb I’m looking for. At the end of the maze is the helm of light which should mean an end to dark screenshots for the rest of this game. It takes me a while to figure it out but my belongings which were removed when I entered the maze are all stored inside this hollow tree just outside. Its onto the next dungeon. This one turns out to be quite a bit harder with a fair quantity of monsters. I have to load/save a bit but manage to struggle through it. There are plenty of traps of one sort or another – among all the flames here I find a body with the orb on it. Elsewhere a suspicious bit of colour among some debris turns out to be the ring of reagents which means I won’t need reagents to cast spells for the rest of the game (if I ever find my spellbook). This will be seriously useful – I was never that keen on needing reagents for spells anyway and this is more like a return to the Ultima 3 days. I don’t find anything else in the dungeon other that a locked door that I can’t get through. No doubt there is a key somewhere but I think I’ve got everything in here anyway so I move onto the next one. There is a very talkative dragon in this dungeon who seems friendly enough although Shamino takes a dislike to him. He gives me some info on the world and also asks me a few riddles – I get onto the last one and I’m sure I’ve got the answer right but he doesn’t agree. This dungeon is the lair of a liche who has filled it with undead and half spider/half man creatures. The spider things deal out quite a bit of damage with their bows but aren’t too bad at close range. The monsters can be avoided for the most part but this dungeon is quite a maze with plenty of secret areas I have to find. There are also lever puzzles where I have to pick a combination of levers to add up to a certain sum in three successive rooms. This brings me to an illusionary fire which I can walk straight through. A few dragon skeletons and a lot of dead automatons later, I make it through to the liches lair. This liche is seriously tough and tries to burn us to death as soon as we enter into the room. Up until this point I’ve not had too much trouble tackling the add-on with this party but I really needed to level up before this. In the end I manage to back away from the fireball and hide for a bit while I recover health. I then attempt the battle a load of times and after about 20 attempts I get lucky and we trap the liche in a corner and quickly hack him to death. There is the usual treasure horde and I find here the final orb, the extra powerful axe + the quickness gloves as well as a load of money and gems. I’ve got a lot of gold nuggets and gems now – I hope there is some way of converting these to cash. I have all the gems now so its back to the keep to try to figure out what to do with them. This stumps me for a bit until I find a button hidden behind a lamp which opens up a stairway. I place all the orbs on the pedastels. When I select the correct pedastel the orb turns black. The door opens and I get the silver seed. At this point the three monks who I met before the quests appear. The guide they have been referring to is actually the guardian under a different name. They all attack at once but are a lot easier to defeat than that liche was. Conveniently they have on their bodies the keys I need to get through to the next bit. If they just hadn’t shown up, I wouldn’t have been able to do anything with the seed anyway. The locked doors take me through to a glade where I’m advised by the chief monk to plant the silver seed. The seed doesn’t hang about and the tree of balance is fully grown in seconds. That completes the add-on back so its back to the main game tommorow. This pack was a lot more satisfying than Forge of Virtue and better value for money. It was a strange idea of Origin’s really to release these packs in the way they did as they didn’t come out until long after the original game by which point all the fans would already have finished it. It only makes sense when you can buy it at the same time. Forge of Virtue was so short and upped my stats so much that it just felt like an official cheat patch. This has given me some nice items and a lot of experience but I’ll still have to train to raise my stats and it strikes a better balance overall. Whether growing the tree will have any long term effect I’m unsure. The monk at the end says I will have an easier time restoring the balance because of it but I’ve no idea what that will mean in practice.